I've got another Tiddly Inks Valentine to share today, this time the sweet Grow A Little Love Wryn is the star of the show. I guess I can't get over those cute heart shaped flowers, LOL! I wish the photo showed it better but that embossed heart background adds a lot more detail to this CAS design than it shows here. I even used Copics to color a few of them which really became the only embellishment on this card... talk about simple. I'm gonna go ahead and throw this card into the current 'love' challenge over at Tiddly Inks too. Oh this is very Beautiful!!!! LOVE it!!! Your coloring is always so flawless looking!!! Have a very Fun and Fabulous weekend!!!! Such a sweet card! 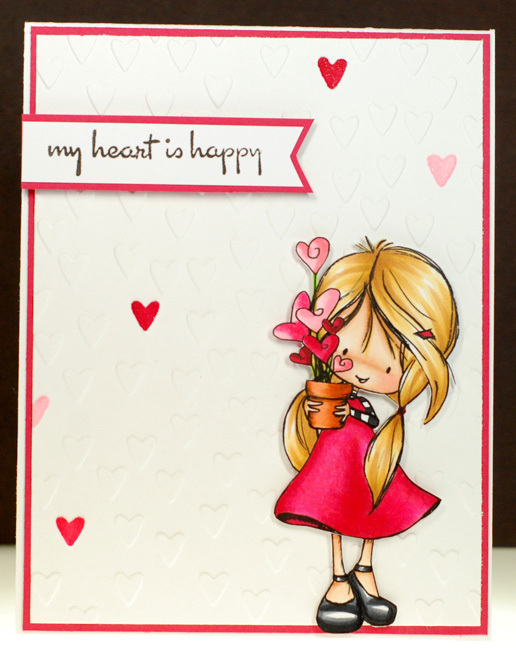 I adore your coloring and the little hearts on the background are such a nice touch! Thanks for sharing your love with Tiddly Inks Challenge. another beautiful take ^_^. i really love how you colour her and best of all you even give the list of the copic you use. you are so kind. So sweet! Love that shade of red you achieved on her dress! Thanks for sharing your card, and good luck on the Tiddly Inks challenge. This is gorgeous! I like how you colored some of the background hearts in too! Thank You for joining us at Tiddly Inks! I wish you a Happy 2016!